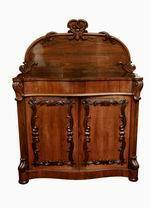 Stunning Quality Antique Victorian Figured Walnut, Ormolu Mounted Inlaid Breakfront Credenza Sideboard, circa 1860. 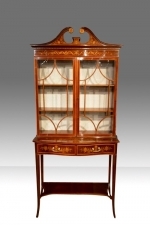 It has elegant glazed doors on either side and a central panelled door which is adorned with a hand painted Sevres porcelain plaque and ormolu swags.There are three similar plaques in the frieze, which are further decorated with exquisite ormolu mounts. 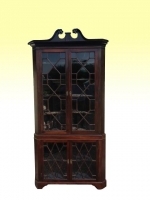 The Inlaid glazed side doors open to reveal two Inlaid shelves in each section, ideal for displaying your collectables, the central door opens to reveal a central shelf and plenty of storage space for glasses, crockery, etc,. 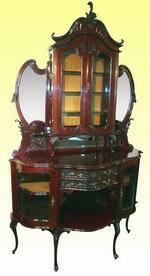 The interior has been relined in an elegant beige velvet. 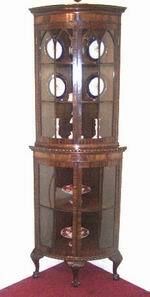 The front displays four beautifully inlaid columns sitting on ormolu mounts and topped with ormolu Corinthian capitals. 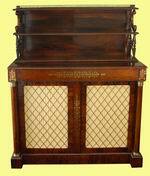 This opulent Victorian antique credenza stands on polished ebonised feet, has the original back board .This Credenza has striking satinwood and walnut inlay. 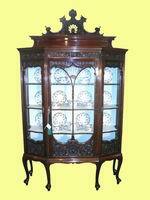 Very Fine Quality Carving and Wonderful Period Patina and Colour. 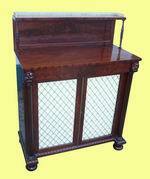 230cm wide x 73cm deep x 97cm table height plus 34cm back pediment height . 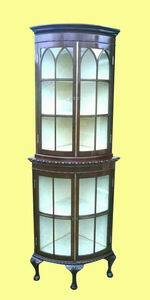 90.5ins wide x 28.75ins deep 38ins table height plus 13.5ins back pediment height . 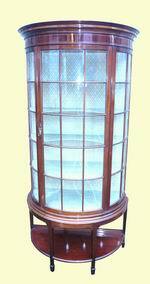 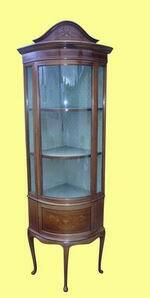 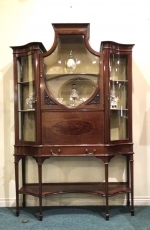 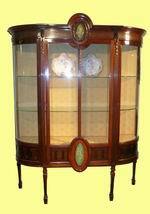 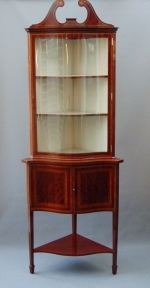 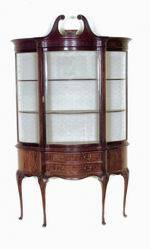 A Bijouterie Pedestal Display Cabinet Vitrine of oval shape. 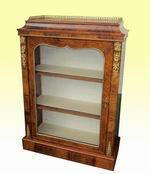 These beautiful proportioned cabinets have a rectangular top which is beautifully veneered in walnut. 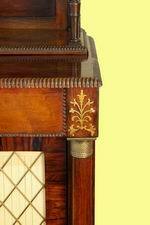 The frieze between the top edge and the door has a floral marquetry panel.Above the door is a cast brass beading. 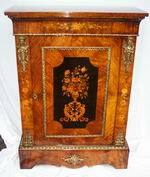 There are ormolu mounts on the top and bottom of side pillars,and also brass mounts on sides and a glazed door which is also brass bound. 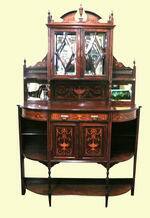 There is floral marquetry on the top corners of the door, and marquetry panels on side pillars. 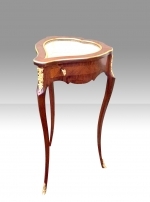 The whole piece stands on a shaped plinth with shaped front and sides. 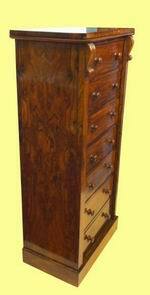 The cabinets are one left handed and one right handed with working locks. 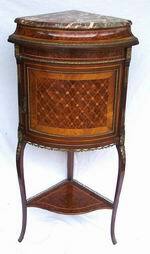 Stunning Inlaid Satinwood Bijouterie Display Table Cabinet. 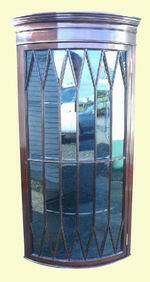 25ins wide x 17ins deep x 30ins high. 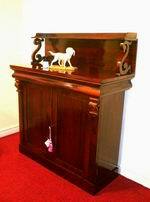 Lovely Mahogany Irish Georgian Antique Side Board Of Very Neat Proportions. 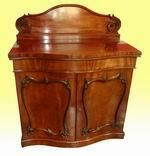 The cabinets have a rectangular top which is beautifully quarter veneered in walnut. 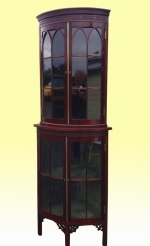 There are ormolu mounts on the top and bottom of side pillars and a serpentine shaped glazed door which is also brass bound. 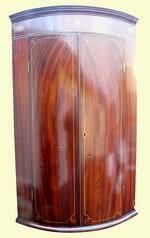 There is floral marquetry on the top corners of the door, and marquetry panels on side pillars. 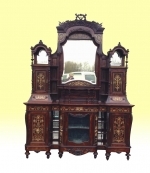 A Superb gallery and superstructure with mirror. 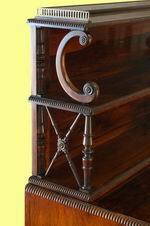 The single frieze drawer above two grilled cupboard doors with superbly carved scroll supports resting on a concave plinth. 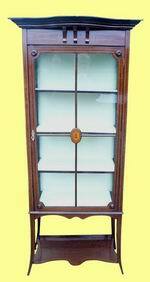 Cabinet a - 45ins wide x 43ins x 12.5ins deep. 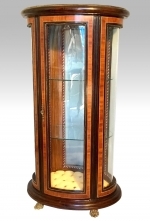 There are five beautiful panels which have been hand painted with cubits and romantic figures in 18th century costume in a garden landscape by a French 19th Century artist .The cabinet is raised on six tapering legs ending in sabots . 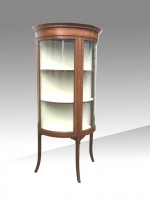 This beautiful cabinet is glazed on five sides, note the serpentine and concave shape, has a cupboard in the bottom and is trimmed in ormolu mounts. 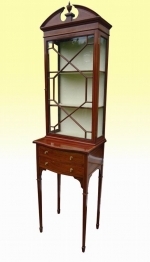 If there is a genunine reason for you not being happy with your purchase that is if you feel we described the items incorrectly, we will offer you a full refund on the purchase price (all you will have to do is pay the return courier fee). 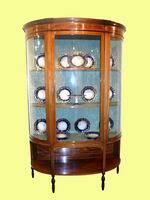 This cabinet is stunning quality colour and condition. 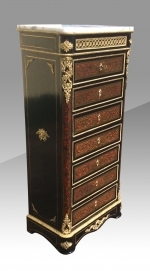 An outstanding French boulle Louis XV style ebonised wellington secretaire chest with secretaire writing compartment and three oak lined drawers.The chest has extremely good quality engraved brass and red tortoise shell inlay with ormolu mounted ebonised sides and single brass string inlay with white carrara marble top finished with bronze gilt ormolu mounts and moulds. 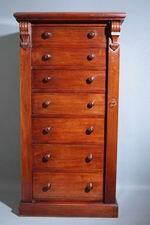 Inside, the chest is veneered in rosewood and has two smallconcave fronted oak lined drawers .The writing surface has a fitted royal blue velvet.All the drawers have their original working locks and key. 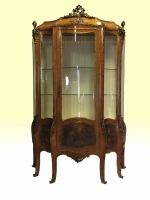 This exquisite small size credenza, having a central serpentine shaped door which opens to reveal a shelved interior and flanked by serpentine glazed doors to each end,sitting on a lovely shaped plinth which is also surmounted by gilt bronze mounts. 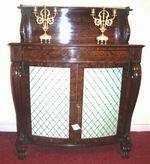 The Credenza is in excellent condition throughout. 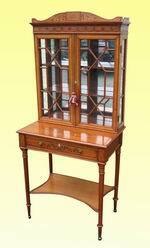 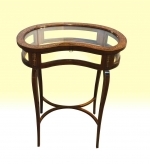 Shaped Rosewood Bijouterie Display Cabinet Table Surmounted With Ormolu Mounts. 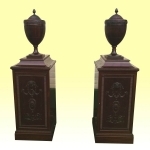 Fabulous Pair Of William IV Antique Mahogany Bedside Chests,Cabinets. 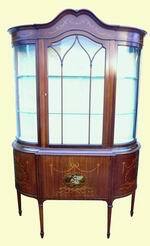 A Magnificent Victorian Figured and Burr Walnut Antique Credenza with central hinged door flanked by glazed serpentine shaped glazed ends all opening to reveal shelved storage and display area lined with cream fabric , the entire piece with fabulous Marquetry also inlaid with satin wood line detail . 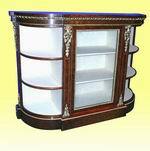 Ormolu mounts are of also high quality . 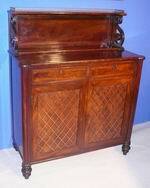 Magnificent antique mahogany inlaid cabinet on stand by Edwards & Roberts Of London of stunning quality. 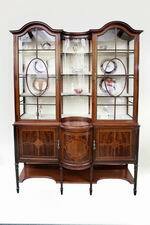 A Magnificent antique mahogany inlaid cabinet on stand by Edwards & Roberts Of London of stunning quality. 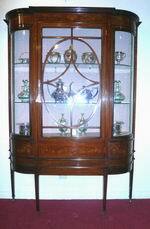 Superb quality mahogany antique. 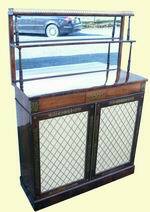 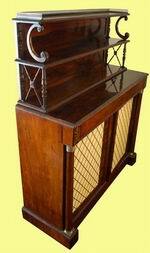 Victorian four door side board. 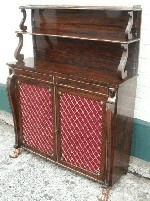 A high quality mahogany Victorian Period four door side board. 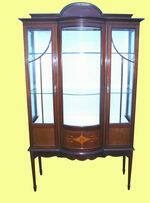 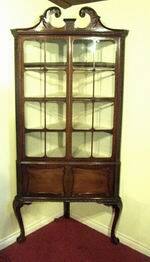 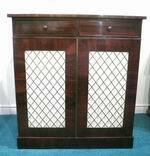 Quality Antique Bow Front Demi Lune inlaid Mahogany Display Cabinet Of Small Narrow Proportions. 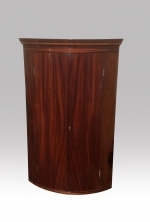 62ins tall X 30ins wide. 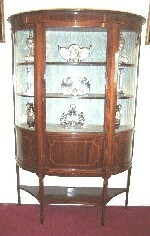 With Inlaid And Marquetry Work. 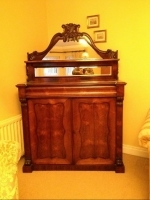 With Original Perfect Bevelled Mirrors.Drawer over Two Cupboard Doors. 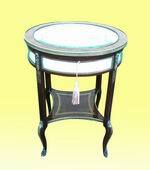 Fabulous Brass Inlaid and Brass Mounted Antique Mahogany Circular Bijouterie Display Table. 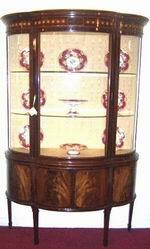 Super Fine Quality Inlaid Marquetry Mahogany Antique Display Cabinet. 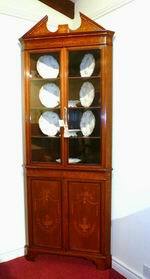 c1860 63ins x 42ins x 17ins.